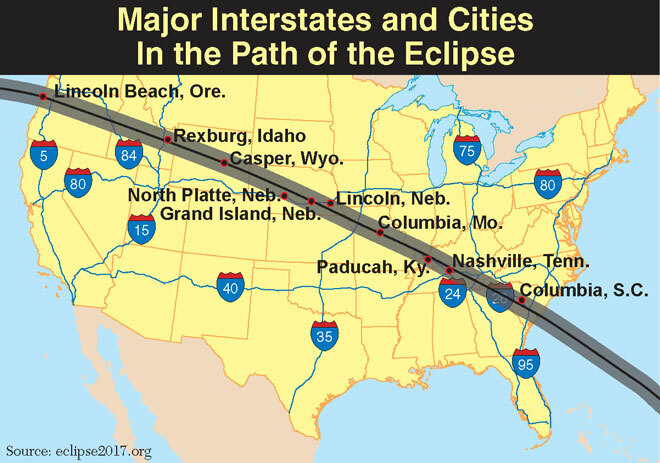 Several states have adjusted their freight transportation schedules to avoid the influx of traffic bound to snarl the nation’s highways as people descend on the best viewing spots for the upcoming solar eclipse. Officials at some state transportation departments have gone so far as to request that trucking companies limit deliveries altogether, or cut back on extra-wide loads, in the days surrounding the event. On Aug. 21, North America will experience its first coast-to-coast total solar eclipse since 1918, according to NASA. The moon will completely cover the sun. The path of totality, or the strip where the total eclipse is visible, will span 70 miles wide from Oregon to South Carolina. In certain areas the total eclipse can be observed for 2 minutes, 40 seconds. A partial eclipse will also be visible from anywhere in the continental states for about 2 hours, 30 minutes, according to the space agency’s Heliophysics Science Division. A bevy of states, as well as the Federal Highway Administration, have created website posts containing safety tips such as driving with headlights on as the sky dims, and even packing extra food. Oregon’s Department of Transportation, as well as the state’s trucking association, advised companies to reschedule their delivery plans. Oregon’s only specific restriction is prohibition of extra-wide loads between Aug. 18-22. Extra-long and overweight loads still will be allowed. About 200 million people live within a day’s drive of the path of totality, according to FHWA. How Do You Feel About the Eclipse? Nashville, Tenn.-based intermodal carrier TCW Inc. is within the eclipse’s path of totality and will maintain its operational schedule, President David Manning said. He noted the Tennessee Department of Transportation has warned drivers not to stop on highways or on their shoulders to watch the eclipse. “The congestion should be a challenge,” Manning said, adding that he expects numerous out-of-state visitors on Tennessee’s roads and that he is concerned they will not all follow TDOT’s guidance. Congestion is an expensive issue for the trucking industry. According to the American Transportation Research Institute, congestion on U.S. highways cost the industry $63.4 billion in 2015, the latest data available. House compared the eclipse to the few occasions in the fall when the University of Oregon and Oregon State University host football games on the same day, creating congestion along Interstate 5, which connects the two universities. He expects the eclipse to be 10 times worse. The first point of contact will be at Lincoln Beach, Ore. at 9:05 a.m. PDT. Totality begins there at 10:16 a.m.
Other states are encouraging rescheduling and establishing weight restrictions. The transportation departments of Missouri and Idaho, as well as the Wyoming Trucking Association, have issued similar warnings. According to Wyoming Trucking Association Managing Director Sheila Foertsch, no overweight or oversize vehicles will travel Aug. 20-22. Scot Montgomery, captain of the Wyoming Highway Patrol, said overweight vehicles range from 40,000 to 136,000 pounds while “superloads” are a maximum of 160,000 pounds. Julie Pipal, president of the Idaho Trucking Association, said vehicles with loads exceeding 14 feet and 6 inches high, 10 feet wide, and 100 feet long may not travel after 4 p.m. on Aug. 20 until dawn Aug. 22. DeAnne Rickabaugh, a project manager within Missouri DOT’s Motor Carrier Services Division, is working with companies so that superloads will move before or after Aug. 21. A superload there is 160,000 pounds, 16 feet high, 16 feet wide, and 150 feet long. The eclipse coincides with two other heavy traffic events in Missouri: move-in for university students and the final day of the state fair. While the trucking associations of Nebraska, South Carolina and Kentucky have distributed materials for eclipse awareness, none of them has developed fleet rescheduling plans. Nebraska’s DOT also is restricting oversize loads, and in Kentucky highway message boards will advise people about the eclipse during the week leading up to the event.